Apache Cassandra® is a NoSQL distributed database written in Java and designed for reliability and high scalability. Data nodes are spread across lots of commodity servers and even between datacenters. Information is kept in-memory for fast read and write response times, then “flushed” to disk when memory fills. Because Cassandra is built in Java, it is subject to the limitations and performance hiccups associated with traditional Java Virtual Machines (JVMs). 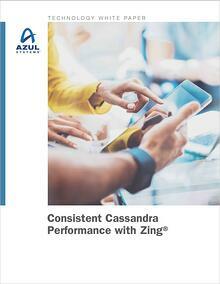 Zing is an innovative JVM that removes garbage collection as an issue. Now your deployment can have consistent response times all the time, without GC pauses, node hangs or out-of-memory errors, regardless of load or object allocation rates.